The Navy SEALs used a new secret stealth helicopter that was almost silent when in operation. 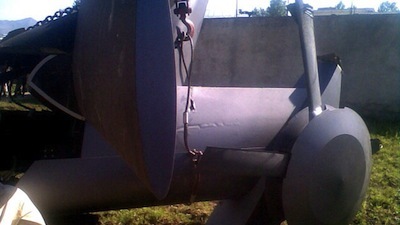 One of the copters struck a wall, and was disabled; the tail section of this copter is shown below. ...photos of what survived the explosion -- the tail section of the craft with curious modifications -- has sent military analysts buzzing about a stealth helicopter program that was only rumored to exist. From a modified tail boom to a noise reducing covering on the rear rotors and a special high-tech material similar to that used in stealth fighters, former Department of Defense official and vice president of the Lexington Institute Dan Goure said the bird is like nothing he's ever seen before. "This is a first," he said. "You wouldn't know that it was coming right at you. And that's what's important, because these are coming in fast and low, and if they aren't sounding like they're coming right at you, you might not even react until it's too late... That was clearly part of the success." Neighbors of bin Laden in Abbottabad, Pakistan, told ABC News they didn't hear the helicopters the night of the Sunday raid until they were directly overhead. In the glow of the car's headlights, Morrison made out a helicopter, its rotors turning slowly and its motor making only the slightest purr. 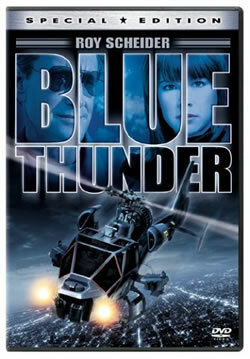 I should also mention the helicopter in the 1983 John Badham film Blue Thunder, which had a special "hush" mode of operation. Via ABC News; thanks to Randall G Modesto for the tip and the reference for this story.